EASTMED GAS PIPELINE: CATALYST FOR END TIMES BIBLICAL PROPHECY? Can I suggest you add David Rosenthal’s website: http://www.zionshope.org to your list of valuable “end times” resources. This video ties current events with end times Biblical prophecy in a coherent, believable manner. David reveals surprising details of the recently proposed EastMed Natural Gas Pipeline and its possible connection to a future invasion of Israel prophesied more than 2,600 years ago. The development of this proposed undersea pipeline may revolutionise the geopolitical landscape of the Middle East and beyond. With Israel’s strategic location, growing wealth, and new-found influence within the natural gas energy sector, the potential for political conflict and another major war in the Middle East only continues to grow. Most importantly, this pipeline may ultimately prove to be a catalyst for the future fulfilment of end-time Bible prophecy. The scientific studies on the hazards of 5G overwhelmingly demonstrate that it is dangerous to our health, extremely dangerous. With respect to the topic of the headline of this post, the relevant part starts at 14:15 speaking about 5G tracking and identifying you in the most dystopian form. Will this be the means by which the Antichrist will detect recalcitrant Christians who refuse to take the mark and worship his image? Make sure you watch the video to the end. How quickly the world is descending into the Days of Noah – “Then the Lord saw that the wickedness of man was great in the earth, and that every intent of the thoughts of his heart was only evil continually. And the Lord was sorry that He had made man on the earth and was grieved in His heart.” What followed was the destruction of mankind with the exception of Noah and his family (8 people). In this short video, Jonathan Cahn tells it like it is, the world is operating as if God does not exist, oblivious to the coming judgement. What concerns me greatly, is that much of the traditional church is compromising with the world and no longer standing on the inerrant Word of God. The Word that tells us how the “end times” plays out before Jesus return to rule and reign in the Millennium. This prophetic vision “I am bringing a shaking like an unstoppable train” given to Bill Yount is I believe authentic and hence I am reproducing part of it here for your consideration. Bill Yount has been a member of Bridge of Life Church in Hagerstown, Maryland, for the past 40 years and is in leadership. He faithfully served in prison ministry at Mount Hope Inc. for 23 years. “I stood in the valley of a highway. Suddenly, what appeared to be a huge locomotive train barrelled down the highway straight toward me. The wheels shaved the concrete, and its power shook the earth in proclamation” “I don’t need tracks!” I was paralysed by the terror of it as highways and overpasses crumbled in its wake. Mountains were shaken and surrendered their strength and majesty. All the earth was vulnerable to this all-inclusive power. I was astounded. My whole world was shaking, and yet I was still standing. After several weeks of earnest prayer, the Holy Spirit helped me to understand this experience of being transported and provided the interpretation. I saw the fire of God falling on every denomination wherever there was a smell of smoke from a flickering flame of love gone out long ago. People in all denominations will be visited by a rekindling, as well as so-called Spirit-filled churches. “A bruised reed He will not break, and a smouldering wick He will not quench, until He renders judgement unto victory” ( Matt. 12:20 ). 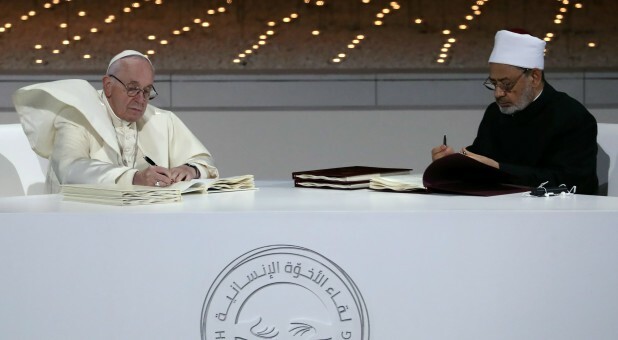 This historic interfaith covenant was signed in the Middle East on Monday, and the mainstream media in the United States has been almost entirely silent about it. Sheikh Ahmed al-Tayeb is considered to be the most important imam in Sunni Islam. 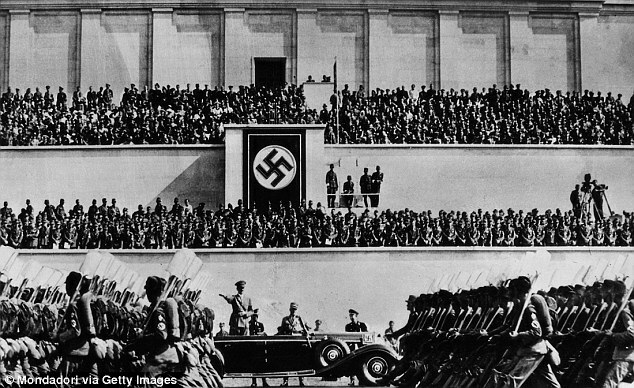 This wasn’t just a ceremony for Catholics and Muslims. According to a British news source, the signing of this covenant was done “in front of a global audience of religious leaders from Christianity, Islam, Judaism and other faiths”. In other words, there was a concerted effort to make sure that all of the religions of the world were represented at this gathering. We, who believe in God and in the final meeting with Him and His judgement, on the basis of our religious and moral responsibility, and through this Document, call upon ourselves, upon the leaders of the world as well as the architects of international policy and world economy, to work strenuously to spread the culture of tolerance and of living together in peace; to intervene at the earliest opportunity to stop the shedding of innocent blood and bring an end to wars, conflicts, environmental decay and the moral and cultural decline that the world is presently experiencing. On top of that, the document also boldly declares that “the diversity of religions” that we see in the world was “willed by God”. We know the Bible prophecies a one world religion in the “end times” but to see the most important clerics from both Catholicism and Islam make such a dramatic public push for it is absolutely amazing and stunning proof we are seeing end times prophecy being fulfilled in our day. The official logo for the Pope’s apostolic visit to the cities of Rabat and Casablanca on March 30-31, 2019 (pictured below) was chosen from among 50 competition entries, a Jan. 7 statement released by the Vatican said. The images are disturbing, unnerving. But they are real. All too real. A rock band is performing in Indonesia to the delight of the audience when suddenly, without warning, a massive wave sweeps them off the stage to their deaths. There are screams of terror; then there is blackness. This is what sudden destruction looks like. Yet the Bible says it will come one day to the whole earth. The band was named “Seventeen,” with a large Instagram following, and the band’s sole surviving member, Riefian Fajarsyah, lost his wife in the tsunami. 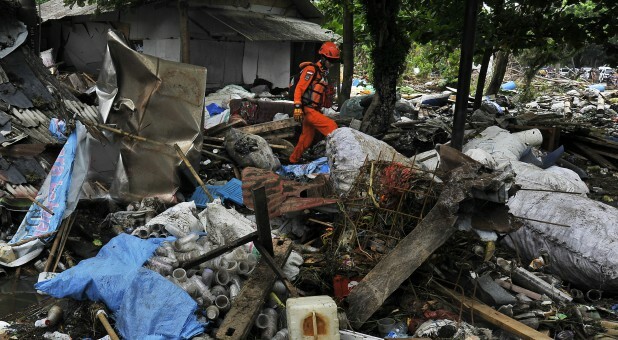 To date, the death toll nationwide has reached 430, with another 1,500 injured and almost 22,000 displaced. Of course, as tragic as these figures are, they pale in comparison to the 2004 tsunami which struck multiple countries at the same time and resulted in a death toll of 227,000. But, in the aftermath of the 2004 tragedy, “countries including the U.K., Germany and Malaysia donated detection buoys and other equipment to Indonesia to help warn of future tsunamis,” although upgrading has been needed for the equipment. Still, the recent tsunami came without warning. It was literally a matter of seconds. Moments later, there was devastation. Yet, to repeat, the Bible says that this will happen again in much greater fashion and on a much grander scale. As Paul wrote to the Thessalonians, “For you know perfectly that the day of the Lord will come like a thief in the night. When they say, “Peace and safety!” then sudden destruction will come upon them as labour upon a woman with child, and they shall not escape” (1 Thessalonians 5:2-3). Please don’t take these words lightly. If you believe the Bible to be true, then what Paul wrote will come to pass. Just as it was in the days of Noah, so will it be in the days of the Son of Man. They were eating, drinking, marrying, and were given in marriage until the day when Noah entered the ark. Then the flood came and destroyed them all. “Likewise as it was in the days of Lot: They ate, they drank, they bought, they sold, they planted, they built. But on the day that Lot departed from Sodom, fire and brimstone rained from heaven and destroyed them all. So will it be on the day when the Son of Man is revealed (Luke 17:26-30). People will ignore the signs of the times. They will be lulled into a sense of false security. They will be caught up with the spirit of the world, enjoying their lives, focusing on themselves, oblivious to God and His demands. They will be sure that “all is well” and that judgement will never come. And then, suddenly, it will be at the door. And then, suddenly, it will be too late. Jesus and Paul gave these warnings for a reason. It was so that we who believe, we who love the Lord, would not be caught unawares. It was so that we would be serving and alert rather than partying and slumbering. We who walk in the light, we who are children of the day, we who live lives honouring to the Lord, have nothing to fear. Let us not fall asleep in the light. This prophetic word from Torben fits with Bible “end times” prophecies so I would urge you to set aside 5 minutes to listen to it.